There are NO HOOKUPS anywhere at Yosemite. That means no water, no sewer and no electrical. you can use a generator during selected hours which are posted at the campground. You can find dump stations year round in the Yosemite Valley, in summer at Wawona and Tuolumne Meadows. Campsites fill up daily April through September. Find out how to make your reservations and do it ahead of time for peace of mind. If that fails, plan to get to first-come, first-served campgrounds as early as possible. 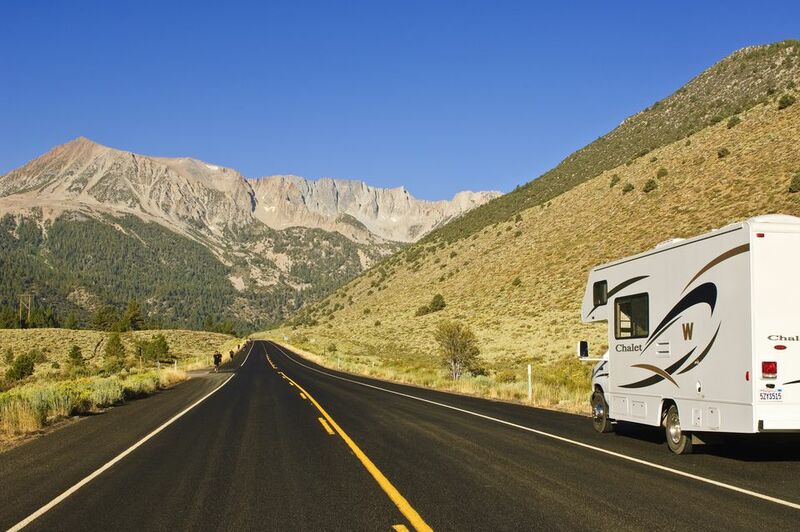 The maximum length in Yosemite Valley for RVs is 40 feet long. Trailers are limited to 35 feet long. Only a dozen of the Yosemite Valley sites can take the bigger campers. Most sites are limited to 35-foot RVs and 24-foot trailers. If your vehicle is larger than that, try these places to camp outside of Yosemite Valley. Quiet hours are 10:00 p.m. to 6:00 a.m.
No matter whether you're in a hard-sided RV or a soft-sided pop-up tent trailer, you need to be bear aware and follow these tips to keep your food and vehicle safe. Glacier Point Road, Mariposa Grove Road and Hetch Hetchy Road have restrictions that affect some RVs and most trailers. During the day, you can park larger class A and B vehicles at the Half Dome Village Day Use Park (formerly Curry Village Day Use Parking), in the lot west of Yosemite Valley Lodge (formerly Yosemite Lodge) and across the road from Camp 4. You can park smaller class C RVs in the day-use parking area at Yosemite Village or in the parking area west of Yosemite Valley Lodge. To rent an RV to camp at Yosemite, try the resources list in California RV Rental or Southern California Tent Trailer Rentals. Upper Pines: RVs 35 ft, trailers 24 ft. Dump station. Open all year. Lower Pines: RVs 40 ft, trailers 35 ft. Dump station. Open March - October. North Pines: RVs 40 ft, trailers 35 ft. Dump station. Open April - September. Wawona: RVs and trailers 35 ft (horse sites 27 ft). Dump station nearby (summer only). Open year round, horse sites April - October. Bridalveil Creek: RVs 35 ft, trailers 24 ft. Nearest dump station is at Wawona (summer) or in Yosemite Valley. Open July - early September. No reservations. Hodgdon Meadow: RVs 35 ft, trailers 27 ft. Nearest dump station in Yosemite Valley. Open all year. Reservations April - October, first-come, first-served the rest of the year. Crane Flat: RVs 35 ft, trailers 27 ft. Nearest dump stations in Yosemite Valley or Tuolumne Meadows. July - September. Half are first-come, first-served. Starting nearest to Yosemite Valley. RVs and trailers are not recommended at Tamarack Flat or Yosemite Creek. White Wolf: RVs 27 ft, trailers 24 ft. Nearest dump station Yosemite Valley or Tuolumne Meadows. July - early September. No reservations. Porcupine Flat: RVs 24 ft, trailers 20 ft. Nearest dump station Yosemite Valley or Tuolumne Meadows. July - mid-October. No reservations required. No pets. Tuolumne Meadows: RVs and trailers 35 ft (horse sites 27 ft). Dump station. July - late September. Half are first-come, first-served. If you're concerned about getting your vehicle up steep grades, avoid CA Hwy 120 through Groveland. The Priest Grade east of Yosemite climbs from 910 feet (280m) to 2,450 feet (750m) in just six miles. It's no wonder you smell burning brakes as people try to get down it safely. On the other side of the park, CA Hwy 120 climbs over the Tioga Pass from about 4,000 feet at Yosemite Valley to 9,945 feet at the summit. If five or more vehicles are following you, find a place to pull over safely and let them pass. It's a California state law. If you go to Yosemite in the winter, find out what you need to know about California snow chain requirements.